Today’s lesson on Basic Western Boxing for Martial Arts Cross Training brought my client up to the four and a half hour mark in his scheduled 10 hour course. 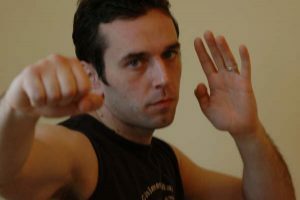 We primarily focused on the hook punch, but also revised previous lesson techniques and introduced the uppercut. We began with our standard boxing footwork warm-up using agility markers and partner training. We then moved onto the focus mitts and drilling jabs, crosses, bobbing and slipping. Modern western boxing excels in the way it coordinates punching, upper body movement and footwork. It is not just the raw punching speed and power that has been developed within its restrictive rule-set, but how an individual uses those tools to move around obstacles and dictates the fight that makes western boxing stand out. Next I brought in the standard hook to the head off both the lead and reverse hands. We looked at correct core rotation delivered in coordination with driving off from the feet. I checked guard retention after throwing the hook and we worked hard to defeat telegraphing. Like any punch, the natural inclination for a beginner is to try to wield the power of the technique using their arm. The hook can easily be telegraphed when thrown using this clubbing action and it has been postulated that Ancient Greek boxers and 18th to 19th century pugilists used this crude version of the hook. Only with the advent of mufflers (boxing gloves) did the hook become a more efficient and less easily seen punching tool. Its efficiency has been praised by such respected self-defence icons as Geoff Thompson and, specifically, his “bouncer” mentor, John “Awesome” Anderson. Anderson was well known for throwing a viciously effective short lead left hook from very close range. Having held the focus mitts for both individuals I can testify to the considerable force they could generate in a barehanded punch. Hooks were thrown individually, as a two-punch combination and then as a mid-line punch. With the bobbing motion now involved we trained punching high and low off the same line. This brought us onto the bobbing and weaving or rolling head movement that accommodates attacking with and defending the hook. We trained this stationary and then on the move, first as just an evasive move and then with hook onto the focus mitts (both high and low). We then brought in the straight hook, which is thrown like a jab. After training this final hooking technique for the day I integrated it into other punching combinations. I then introduced the uppercut, which it could be argued is another variation the hook. This technique especially derives its force from driving upwards and, like the hook, can be easily telegraphed if it leaves the guard too early. A common mistake I have seen when beginners throw uppercuts is to “scoop” with punch. Again, this comes from the instinct to rely too much on the arm and not the body that drives the punch. The lesson was finished with a burnout session. My client performed 20 second rounds of combinations, fast single and double punching, and finally full power single punches.